It all stated over Memorial Day weekend when Pedro and I took two students camping and mountain biking in Moab, UT for the weekend (more on that another day). We arrived home late on Monday night and discovered that the school had guests staying in the downstairs bedroom where our storage room happens to be located (we live on the main floor of the house, and the school operates seven guest rooms in the daylight basement). Instead of unloading everything straight into our storage room, we had to leave it in our dining room. The next day, the downstairs guests (volunteers helping on a project at our school) hadn’t left, so Pedro and I made a snap decision to just put everything back into the truck and go camping again on Friday. At the time, it seemed like a good idea. After a day of meetings on Tuesday, I rushed home at four and threw everything in the truck and hurriedly cleaned the house to prepare for the end-of-the-school-year faculty picnic. This made packing for our weekend getaway on Friday easy—toss in the mountain bikes and load a cooler with food and away we went. I should mention at this point that we jokingly call our camping gear ‘an RV without walls’—it’s a lot of stuff—but we like to dry camp in remote places with no neighbors or facilities. Pedro and our son-in-law had camped in the same spot last summer, and explored many of the trails, so I left the route plotting to him whilst I prepared breakfast burritos the next morning. We set off about an hour after breakfast for a 12-mile loop. Within the first half mile of hitting the main trail, I carefully maneuvered around a tricky downhill corner between two trees and looked ahead at the next section of the trail—which lay in the shadows of the towering evergreens. Voices echoed down the trail from behind me, and I glanced back, worried about being in the way of more experienced riders (I have a complex, I suppose, about ‘being in the way’ around more advanced riders). My eyes snapped to the trail ahead when I heard the thud of a bike landing, accompanied by the thud of something heavy hitting the earth. I saw Pedro bounce a time or two and then the forest fell quiet. By the time I reached him, he had started to moan as he struggled to get his breath back. “Where do you hurt?” I asked. Two runners appeared around the corner and called out, asking if everything was o.k. “He thinks he broke his collarbone,” I said. I confess that for about five minutes, all we did was wonder what to do. The runners and I agreed that we all had phones, but we weren’t sure how they could prove helpful. I have no idea where this came from—probably from one of the many First Aid classes I’ve taken over the years. I looked wildly around for something I could use to immobilize his arm, and had horrified visions of me having to shuck my long-sleeved shirt in front of strangers in order to prepare Pedro for a short hike. And then I remembered. 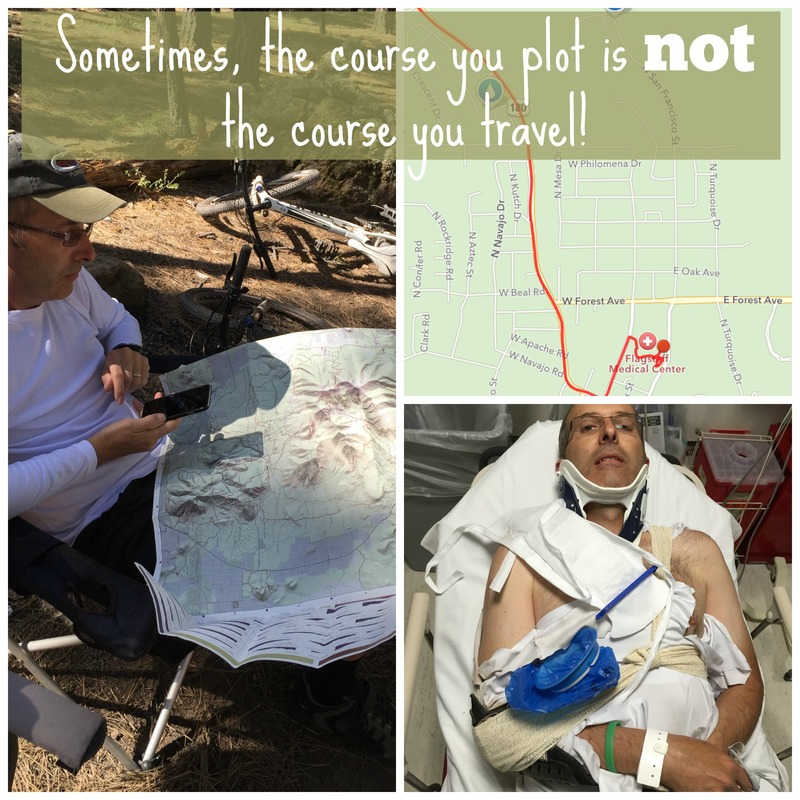 The last time Pedro had crashed, I realized that we didn’t carry enough in the way of First Aid supplies—and since we often had students with us, we really needed some basic things like sterile pads large enough to cover road rash and Ace bandages to use as splints. They nodded, and I took off—even though I didn’t have a clear picture as to where we would meet up, I just knew I needed to get Pedro to a hospital. Ten minutes later, I had my bike stowed inside the tent and I headed down the road to the elusive trailhead. Fortunately, the spotty cell service worked well enough for me to call Pedro (Tony answered) and figure out exactly where they had ended up. Fifty-five minutes after we started our bike ride, we walked into the ER. By this time, Pedro’s pain level had escalated. The efficient staff at Flagstaff Medical Center had us in the triage room within five minutes, and when Pedro started feeling prickly and sweating, they rushed the process, put a collar on him and got him back to a trauma room where they started an IV, drew blood and got some painkillers in him. At one point, the ER doc came in and asked if Pedro had ever had problems with neutropenia since his cancer treatment. I shook my head, but my mind immediately sprang to the worst-case scenario. Sometime must be wrong with his blood! Maybe they found cancer again. I pulled my mind out of that downward spiral and decided I’d better do something productive. They had already done X-Rays and a CT scans to assess the extent of the damage, and the nurse thought it would take at least another hour to get the results. I hopped in the truck and drove back to our campsite to break camp. By the time I returned, the doctor came in to give his official report: Fractured right clavicle, chest wall contusions, fractured left wrist and various other scrapes and bruises. “And a bent iPhone,” Pedro added. 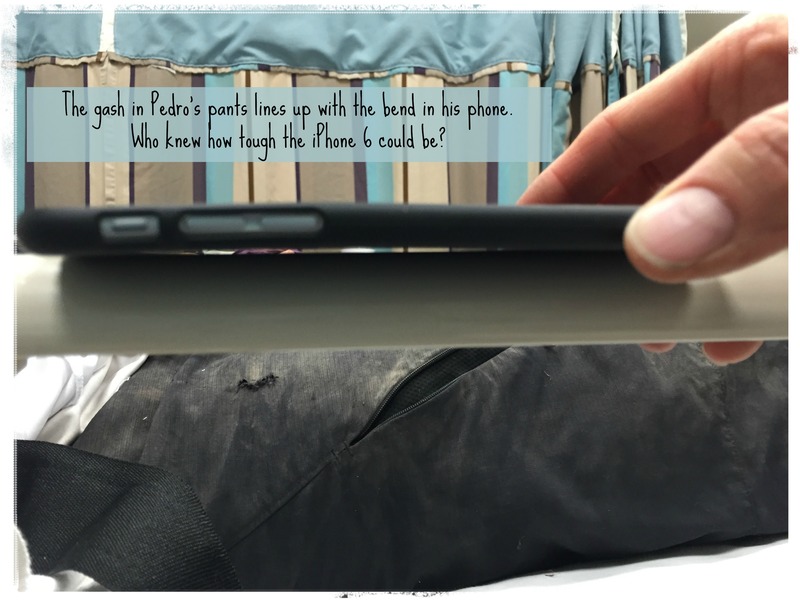 While I’d been gone, he’d dug his phone out of his pocket and discovered that it still worked but that the case and glass had a nice bend in them. I assured him that the bike fared better than the rider. Pedro lamented the fact that he’d crashed so soon after we started, but everyone assured him that it’s much better to crash closer to civilization. 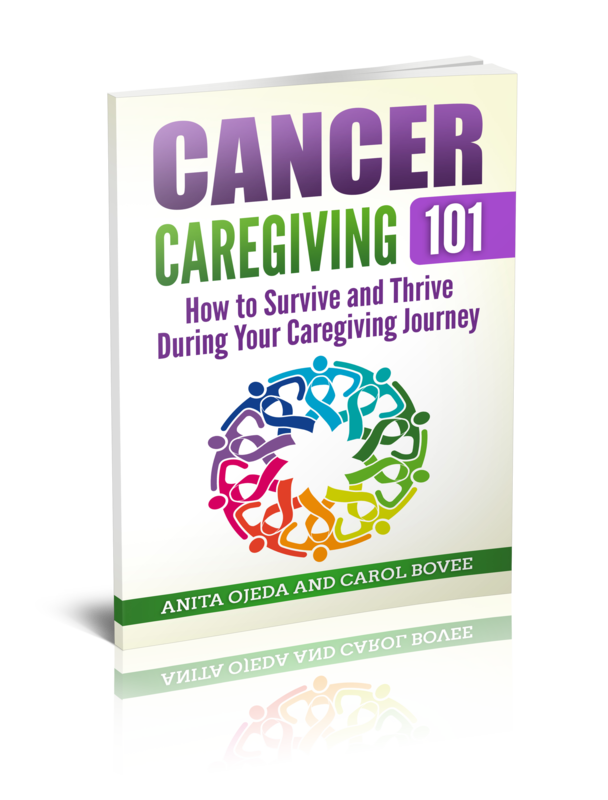 When the doctor went over the medications, he mentioned that one of them couldn’t be given to post-cancer patients who suffered from continuing neutropenia. After the doctor left, a nurse came in to remove Pedro’s elbow pad and put a sling on him before discharging him. We made it home (after a stopping to get something to eat and an hour-long wait at the pharmacy) before five pm. When Pedro sat down to plot our trip neither one of us expected our journey to end this way. We still don’t know all of the ramifications of how his injury will change the course of our summer plans. I teased him about the lengths he’ll go to avoid loading and unloading a moving van (we were supposed to help our daughter and son-in-law move from California to Oklahoma in two weeks). He apologized for forcing me to break camp by myself once again, (this is about the sixth or seventh time in our marriage where he’s gotten injured or ill during a camping trip and I’ve had to pack everything). Be prepared ahead of time. We had the supplies we needed to make it possible for him to hike to the road. Pedro’s motto post-cancer is “Try anything once!” He’s not afraid to take risks, but he rides with elbow and kneepads, not to mention a helmet. God arranges. This time, he sent Good Samaritans to be running down the trail just when we needed them. In addition, Pedro discovered that hospitals made him feel physically ill since his bout with cancer when we visited one of my students who had been in a traumatic car accident about two years ago. The awesome ER staff engaged him in conversations about mountain biking and took time to share trail stories with him—making his visit as pleasant as possible. We are never alone. Stay diligent in the boring things (such as yet another CPR or First Aid class), because you never know when what you learn will come in handy. That temporary sling I made from an Ace bandage? The doctor and nurses kept complimenting the nice sling I’d made. Most importantly of all—our next breath is never guaranteed, so spend every moment possible speaking words of love and affirmation to those around you.